Posted on Wednesday, June 15th, 2011 at 8:53 am. 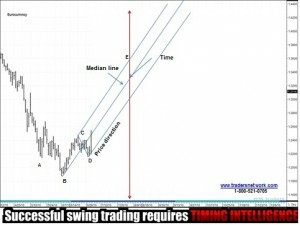 Swing trading is becoming one of the most popular trading approaches. Traders are finding that day-trading can be emotionally and physically draining and long-term investing has become difficult in the current high volatility market trading environment. As traders begin to explore swing trading they are finding that there is a wide variety of swing trading strategies and methods that can provide low-risk and high-reward returns. Some strategies use moving averages and price oscillator indicators for entry and exits, but these indicators can be misleading and leave a lot of potential profits on the table, due to their lagging signals. Others can be subjective and or loaded to with much information. I believe there is only one swing trading methodology that provides all three essential tenets needed for a successful swing trading strategy, i.e. price direction, price objective and time duration. 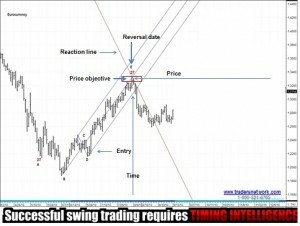 In this article I will introduce you to Swing Trading with Market Timing Intelligence using the Action/Reaction theory. I first read about Action/Reaction in the 1985 when first learned of Roger Babson and his work on Action/Reaction in the early 1900’s. Mr. Babson simply stated that economic phenomena move up and down. In other words, economic activity will not go in one direction without a movement in the opposite direction. From his statement about Action and Reaction, I theorized that market cycles could be looked at from a different point of view than the conventional approach. If the theory is truly based on natural recurring cycles one must only identify where the action ends and the reaction begins and use the past to project the future. So instead of looking from low to low, I should be looking for the exact center of the cycle. When attempting to solve a problem, the most difficult task is finding where to start. In this specific case, the problem was to identify what Action would lead to the equal and opposite Reaction. Markets will always have short-term fluctuations within a longer-term trend as buying and selling influences price action. It is within this price movement that I found the means to identify where the Action ends and the Reaction begins. Each time the market corrects (a short-term move in the opposite direction of the prevailing trend) and then resumes the current trend, an old cycle ends and a new cycle begins. This pattern occurs over and over again in every market, whether one is looking at individual stocks or commodity futures. I call this pattern the Reaction swing. The Reaction swing is a reoccurring pattern that identifies the center of a cycle that divides the action segment from the reaction. Once this pattern is identified, all I need to do is look at the past market action and use that information to project the future market reaction. This represents the balancing point in the cycle; therefore, I can use this pattern to predict a future reversal bar or reaction point – support or resistance – in the market. Using this technique, I can also use the market’s own price action to identify where future support and resistance levels will act as futures price objectives. This is important because, the Action/Reaction swing trading strategy provides enough information to identify the next price direction, target objective and time duration of a future price move. The Action/Reaction swing trading strategy is unique in that you know the profit potential and initial risk before ever entering the trade. This allows you to make your decision with a predetermined trading plan rather entering a trade and waiting to see what happens. The Action/Reaction swing trading strategy differs from many other technical trading methods because it uses the market’s own predictive patterns to identify future market swings. Thus, it is a leading indicator that allows traders to trade from one market swing pattern to another with a high degree of confidence. Lagging indicators are based off past market action, but tend to confirm turning points after a pivot point has been confirmed. Having foreknowledge of a potential reaction point or Reversal date can give a trader a huge advantage in any type of market. If you can find the exact center of a cycle, you can look back at the beginning and then, based on this information, determine where the cycle (market price) will most likely go in the future and how long it will take to get there. A general observation of the markets shows that they do not trade in a straight line. There is always a struggle for control between the bears and the bulls. In this struggle, each side enjoys victories and suffers defeats, but one or the other will always win in the end. For example, if a market makes a bottom formation after an extended downward move and then trades up to a price where many chart readers believe the market will run into resistance, the bearish traders will move in and sell. The bearish traders believe that the trend is still down and this correction provides a good selling opportunity. This, in turn, pushes the market down against the new upward trend. The result is a price correction also known as a retracement. When a new up trending market corrects or retraces, the price will pull back to predetermined natural support levels. These price levels tend to support any market within any time frame. By using these support and resistance levels, I can determine when and where a correction will most likely begin or end before resuming the prevailing trend. It is this market action that forms a Reaction swing. Reversal dates, or reaction points, are future dates where there is a high probability of a reaction in the market. The majority of the time, this reaction will be a reversal or a pause of the market’s current trend. The reversal can be at either the end of a long-term price move or the beginning of a short-term price correction. On the predicted date, the market will generally break out of the consolidation pattern and continue the trend. Both the reversal and continuation patterns offer extremely important information to a trader because they are used in conjunction with the reverse/forward count to project future reaction points or Reversal dates. Action/Reaction is not an exact science and falls more in line with Fractal laws. This means, I am not looking for perfection in the trading signals, but I am looking for consistent performance. I have never forgotten a statement made by an experienced and successful trader. He said to me, “Amateurs look for perfection, but professionals look for performance, that is what separates the two.” Fractal perfection allows for some variance in the projections of Time and Price. In other words, there are times when Price will accelerate and exceed Time. This means the Price projections are reached before the Time projections are met. On the other hand, there will also be trade signals where Time runs out before the Price projections are met. Either way, you will know in advance when it is time to take action. In the early 1960s, one of Roger Babson’s close friends and students, Dr. Alan Andrews, began to provide a study course based on the theory of the “Law of Action/Reaction.” One of the techniques he taught was called the “Median Line Study.” This technique employed a set of chart lines that were drawn from a significant low or high through the center of the following Reaction swing. Lines were also drawn parallel to the center line, from the high and low of the Reaction swing. When completed, these three lines resembled a pitchfork. Eventually, it became known as the “Andrews Pitchfork” and can be found on many charting programs today. I have found the combination of Roger Babson’s Action/Reaction theory and Dr. Alan Andrews Pitchfork is a powerful indicator of future price action. It seems that I have combined the two in a rather unusual way; yet it has proved to be an uncanny combination for price projection. I call these price projection lines Action/Reaction lines and can be used to identify trend direction, futures support and resistance. When median lines are combined with the reaction points or reversal dates, the results can be uncanny. Understanding this one concept can help to identify “sweet spots” in the market that precede explosive price moves and then help capture the entire price move from the beginning to the end. The next step is to add the Andrews Pitchfork and anchor it at the pivot low marked a (B). By combining a reaction swing price pattern with the Andrews Pitchfork, I am able to predetermine the next price direction. I can also use this information to mark where the projected price bar crosses the ascending median line…the market should reach the target objective on or before this projected price bar. Now I will find the price objective. The Eurocurrency trades higher, off the (D) pivot low, to confirm the reaction swing and triggers a buy signal at 1.2400. The market continues higher, staying inside the two parallel lines of the Andrews Pitchfork, and reaches the reaction line target objective at 1.3330 on the projected reversal date…a classic example of time and price working in harmony. 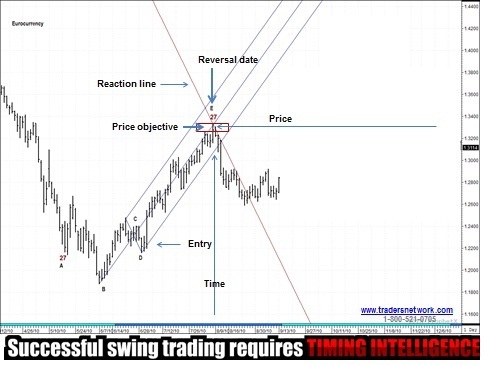 This swing trading strategy is easy to learn and can be used in any market and any time frame. Understanding market structure and price action can improve any swing trading strategy. 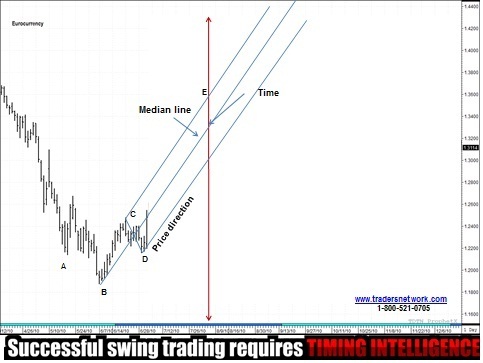 If you would like to learn more about Swing Trading with Market Timing Intelligence using Action/Reaction go to www.tradersnetwork.com and sign up for a free 30-day free trial of the TMV Swing Trade report or a free webinar.